Ellwood Safety's sankey foot guards, to begin with, the foot guards are metal shields worn over shoes for maximum protection to the entire foot-instep as well as toes-against falling, rolling, or flying objects or accidental tool blows. They are designed to withstand an impact of 75 foot pounds, with a large safety factor designed in. Foot guards fit any shoe (no rights or lefts), with 5" (average) and 5-1/2" (large) widths. They are light enough to be worn comfortably all day. To keep the guard properly positioned, it has a rubber toe clip, crossbar, and either a one-piece rubber strap with a tension buckle, or a two-piece leather strap with a spring fastening device. Please indicate choice of rubber strap or spring fastening device. 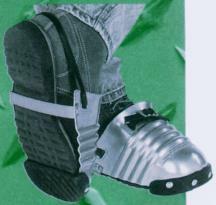 Foot guards are available in aluminum alloy or steel, with equal protection from either metal.